Leading environmental construction products supplier Green Building Store is today (Tuesday 6th January 2009) launching an extensive range of Passivhaus products and services which it hopes will help facilitate the uptake of Passivhaus design and construction in the UK. Green Building Store’s new Passivhaus range can help the UK construction industry create buildings which use 90% less energy for space heating than standard UK buildings. Green Building Store’s Passivhaus range brings together under one roof many of Europe’s leading Passivhaus products, introducing a number of them for the first time to the UK market. Passivhaus windows: Among the most thermally-efficient windows/ doors available in the UK, with whole U values as low as 0.68 W/m2K. Available in FSC 100% timber or timber/ fibreglass composite. Pro Clima airtightness membranes and tapes: Can help buildings achieve the high levels of airtightness required for Passivhaus buildings, as well as protecting building structures from condensation, mould, rot and damp through use of ‘intelligent’ vapour checks. PAUL Heat Recovery Ventilation (MVHR) systems: Heat Recovery Ventilation (also known as Mechanical Ventilation Heat Recovery) is an essential part of Passivhaus building design and helps circulate air and keeps heat in the building, through use of a heat exchanger. PAUL’s heat exchanger is one of the most efficient on the market and can offer exceptional heat recovery of up to 99%. Design & Build: Green Building Store’s sister company Green Building Co. now offers a Passivhaus and ‘low carbon’ design and build service in the West Yorkshire and the North-West regions. Green Building Store’s Passivhaus products will be showcased at this year’s Ecobuild (Stand 1833). Green Building Store Director Chris Herring will be speaking at this year’s Ecobuild on the urgent need for Passivhaus design in the UK (Ecobuild ‘road to zero carbon’ seminar ‘Creating a Passivhaus culture’ Tuesday 3rd March 2009 10.30am). 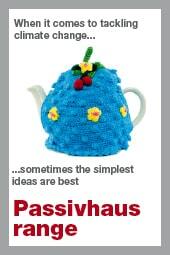 For more information on Green Building Store’s new Passivhaus products and services go to: www.passivhausproducts.co.uk or ring: 01484 461705. Green Building Store believes the UK Government’s strategy on ‘low carbon’ building needs to be urgently revised to put greater emphasis on energy efficiency, airtightness and other Passivhaus design principles and away from ‘eco-bling’ and expensive bolt-on renewables. * Passivhaus buildings require minimal heating input, often relying on incidental gains from occupants’ body heat and cooking/ showering activities. Green Building Store offers Passivhaus and low carbon construction services to homes and projects in the Huddersfield, West Yorkshire area.